Ahh...the simplicity of just a few ingredients often make some of the best recipes, and this one is no exception. 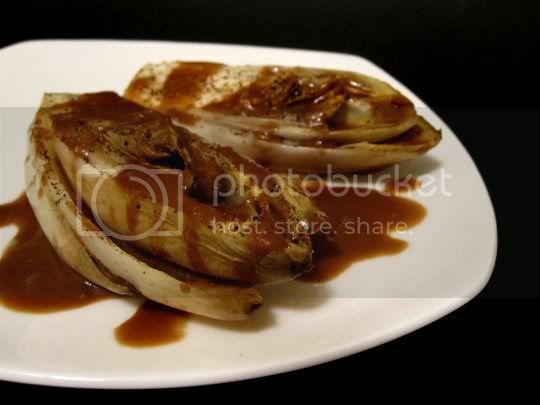 Belgian endive is seasoned with only salt and pepper, then baked and broiled. It's juicy, crunchy, and tender--and such a mildly flavored vegetable is great for the strong, robust, tangy, salty vinaigrette where roasted garlic is the star. Although the recipe suggests roasting an entire head of garlic, I did the cheat method and roasted about half a head's worth of cloves (unpeeled). After about 10-15 minutes, the cloves are soft enough to simply squeeze out the soft garlicky paste. This is combined with only balsamic vinegar, soy sauce, and olive oil for the most amazing vinaigrette to drizzle over the endive. Although this is served warm, I think it would also do well chilled for more of a salad feel. Make again? Yes. Very gourmet-ish, and cheap!